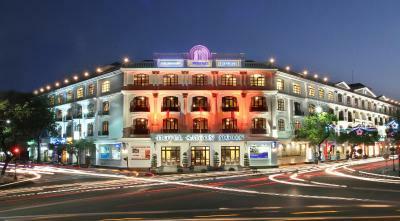 Lock in a great price for Saigon Morin Hotel – rated 8.8 by recent guests! Lovely old french colonial style hotel. Very large room overlooking river. Lovely colonial building beautifully restored in a great location. Friendly, helpful staff, great food and drinks and really good large pool. The staff was so friendly and helpful. 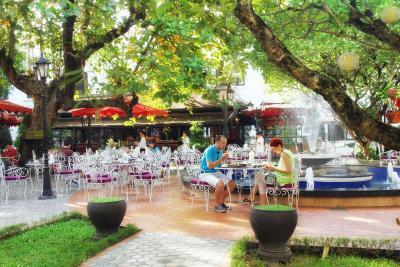 The hotel grounds, pool and our room were all beautiful and the location was perfect for exploring Hue. It was such a charming hotel that newer hotels cannot hope to match. Would not stay anywhere else if we ever come back and highly recommend it to all future travelers. Thank you Saigon Morin! Excellent location. Walking distance to the Imperial City. Room with river views. Breakfast healthy and filling. 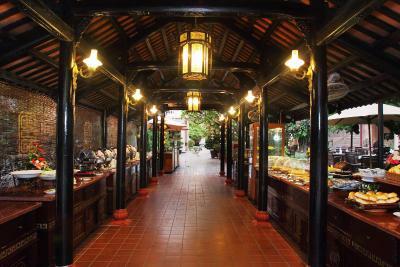 Inner courtyard restuarant was great. Would definitely stay here again. Close to the imperial city, had a nice swimming pool as well as spa services. Great historic hotel with a colonial air about it (buildings - not staff or anything else :) ). Great central location in a really nice city. 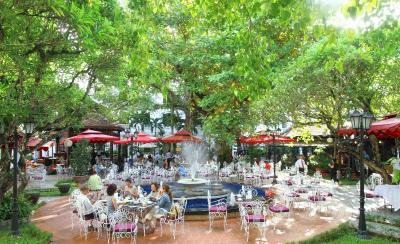 The courtyard was a great place for breakfast. My husband and son tried a western dish (a beef burger) one evening which as no good at all - so stick to the vietnamese dishes. A fine option for a family for a few nights stay, but the pool is quite small. Cool elevator - our kids loved it!. Great and helpful staff. Everything else. 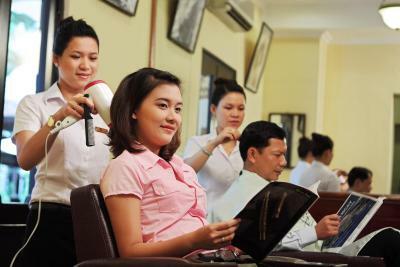 Spa and beauty services. Restaurant. Chaplin movies. Historic ambiance. Fantastic staff and service. 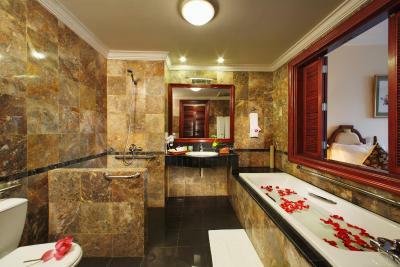 Room was huge with luxury bathroom and nice view. Clean. Nice bed and bedding. Incredible value for money. 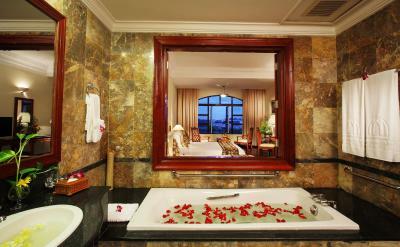 Everything about the Saigon Morin Hotel is great. 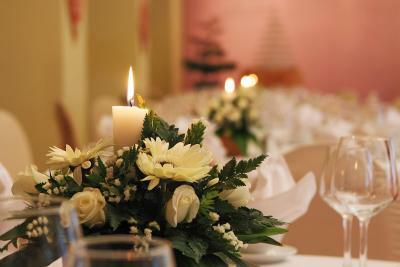 The staff is very nice and attentive, and the rooms are extremely impressive. A magnificient old hotel. Beautiful rooms and staff very nice and competent. 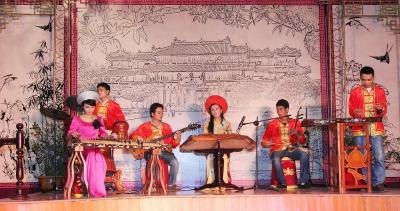 A place to recommand in Hué ! Great location, close to the Citadel and open market. 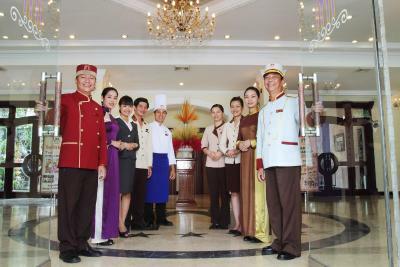 Saigon Morin Hotel This rating is a reflection of how the property compares to the industry standard when it comes to price, facilities and services available. It's based on a self-evaluation by the property. Use this rating to help choose your stay! 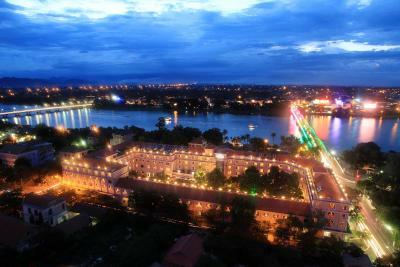 One of our top picks in Hue.Centrally located in Hue, Saigon Morin Hotel overlooks the Perfume River and Truong Tien Bridge. 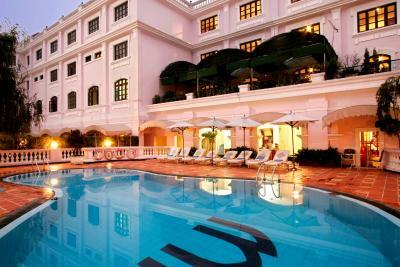 Featuring French colonial architecture, the hotel features an outdoor swimming pool and 3 dining options. 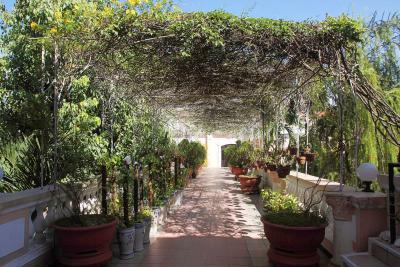 The property has a garden and provides free public parking at a site nearby. 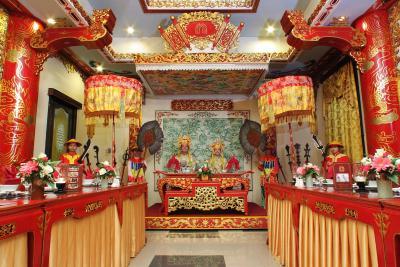 Dong Ba Market and Dieu De National Pagoda are within 5-minute drive from Saigon Morin Hotel. 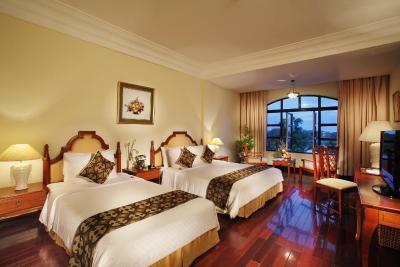 The nearest airport is Phu Bai International Airport, a 30-minute drive from Saigon Morin Hotel. 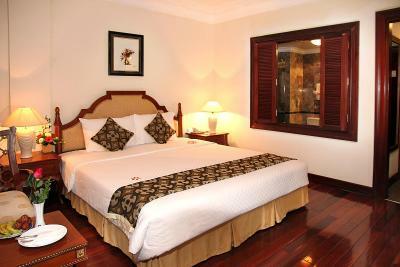 Featuring WiFi access, all rooms are furnished with air conditioning, a desk and personal safe. Views of the city, river and/or swimming pool can be seen from certain rooms. A satellite TV, tea/coffee maker and mini-bar are provided for your convenience. 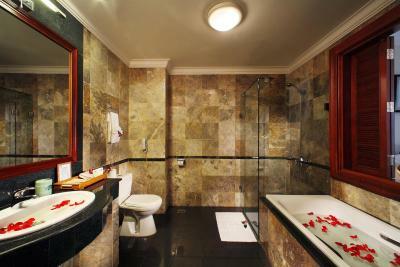 Attached bathroom in each is fitted with a shower, hairdryer and free toiletries. 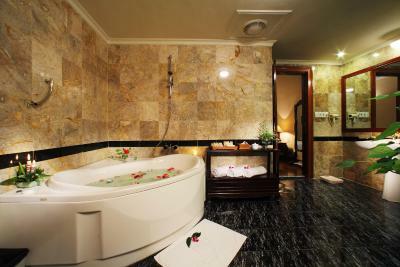 A spa bath is equipped in some rooms. Slippers and bathrobes are included for your comfort. Speaking three languages, staff at the 24-hour front desk are willing to assist with express check-in or check-out, currency exchange and luggage storage. Day trips and shuttle services can be arranged at the tour desk. 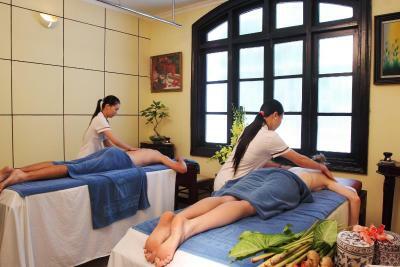 A spa and wellness equipped with a steam room and hot tub is available at the hotel. 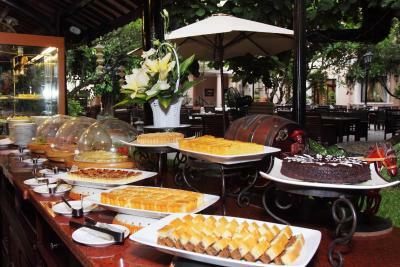 In-house restaurants feature an array of European, Asian and Hue dishes, while the bars serves up to many choices of cocktails, wines, fruit juices and snacks. 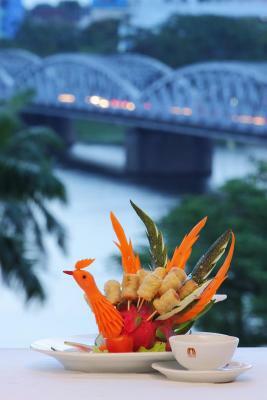 When would you like to stay at Saigon Morin Hotel? 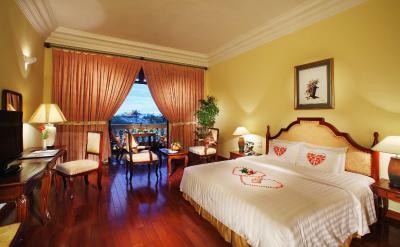 Located on the 1-3 floors and offering city views, colonial-style room features wood flooring and marble bathroom. Rooms with a balcony are on the 1 and 2 floors and are subject to availability upon check-in. Air-conditioned rooms have a TV and views of the sea. 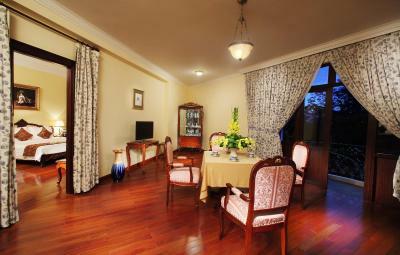 Set on the 1st and 2nd floor of the hotel, suite features parquet floors and views of the city and river. 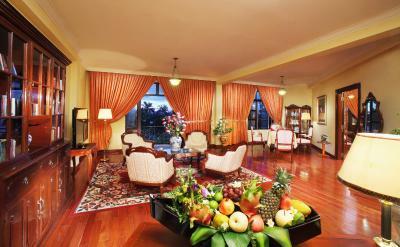 Spacious Suite features a separate living room, parquet floors and views of the Huong River and Truong Tien Bridge. Newly renovated room with beautiful view of the Perfume River. Also known as the Morin Suite, it overlooks the city and river and features a spacious bedroom and living room with wooden flooring. 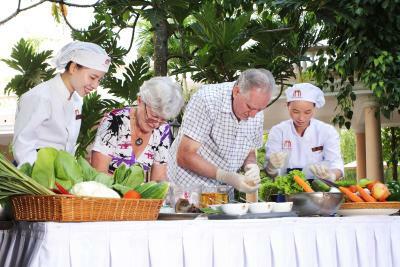 House Rules Saigon Morin Hotel takes special requests – add in the next step! 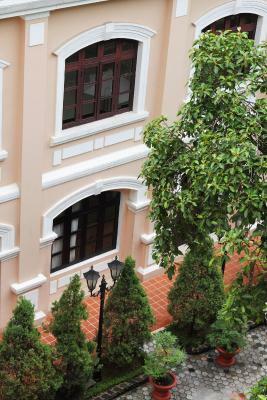 All older children or adults are charged VND 581491.14 per person per night for extra beds. Saigon Morin Hotel accepts these cards and reserves the right to temporarily hold an amount prior to arrival. Breakfast was delicious, lot of different varieties of food. Breakfast in the courtyard is a nice area but too hot this time of year. An air conditioned option for breakfast would be good. 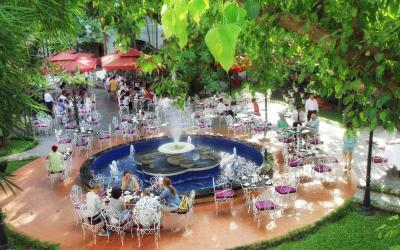 We liked the old world charm of the hotel and the location was in easy walking distance to restaurants. Very warm at breakfast area, could be fixed with some more fans, and also shade parasols at the pool area would be nice. 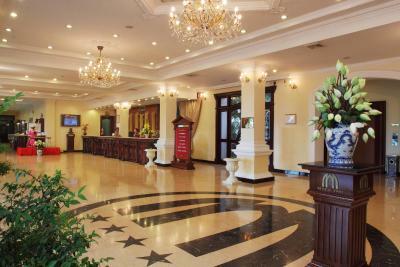 Impressive entrance and lobby area gives atmosphere of old times . 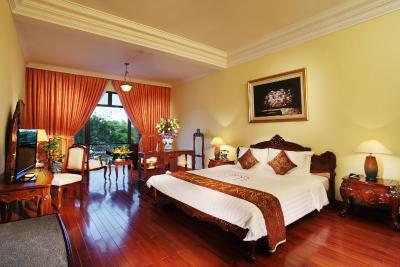 Rooms are big and large beds with wooden floor. Very nice breakfast with freshly made egg of any kinds but lack of fresh fruit. Nice large pool area but limited shade. All requests were granted, excellent position and tour to DMZ zone was fantastic with Hai, our Enlglish speaking guide, just terrific. Our transfer back to Da Nang was also comfortable and in plenty of time for flight. We were terribly disappointed with the Dragon Boat Tour. No English spoken, shocking boat hot and uncomfortable. The Coke Fanta, Beer given us was froma tiny eske with no ice and hot. Far below anything else supplies by the Hotel. On speaking to management we were not charged whick we felt very fair. but did not have enough time to enjoy another boat ride. Staff a bit stiff, not overly helpful. The mattres s was not good. We had also a lot of noise from the street. The rooms are big and the hotel has some charm. The breakfast is good and there is a swimming pool. 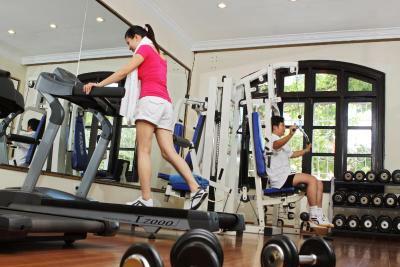 It' s good to have a gym, but the equipment needs to be refurbished. New carpets and shower and bath tub refurbishment. 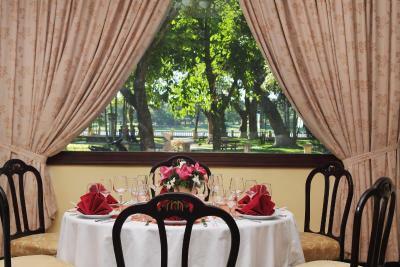 The grandeur of such a classic hotel, the big rooms, the views, the staff and the glorious breakfast and pool. 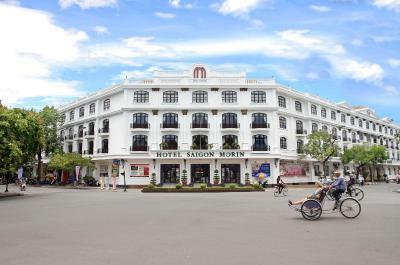 The Saigon Morin is a wonderful old hotel. Friendly staff, delicious breakfast, great rooms. 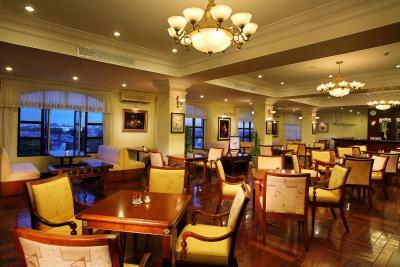 It has the feel of an old world hotel with modern touches. Would highly recommend to anyone! Rooms are in need of modernization. The location of the hotel is perfect. 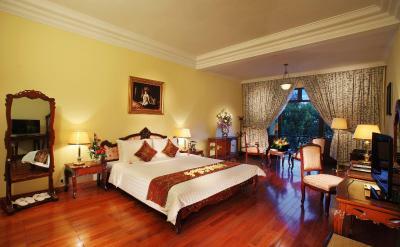 The hotel itself is a classic colonial building that has tried to retain old details. The room was very spaceous but furniture, bathroom etc. were a bit dated. Overall it's a fine hotel to stay a few days. 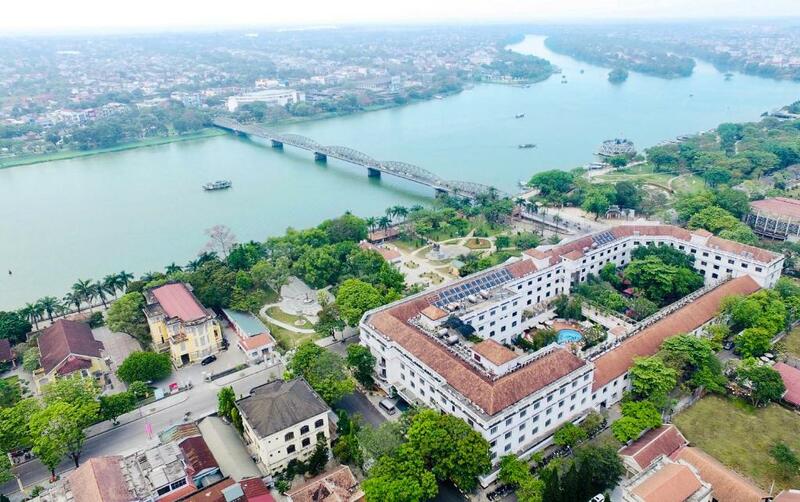 I had booked a room with riverside view and balcony, but when I arrived we were "upgraded" to a suite in that was large and beautiful but smelled somewhat mouldy and overlooked a bridge with dense traffic rather than the river. Moreover the windows had probably not been cleaned in years and were hardly transparent. The breakfast was rather mediocre, and not the rich spectrum of local dishes I was led to expect. Location is excellent. The history of the hotel, and the general ambiance were the reason why I was attracted to this hotel. Everything was fine. This is not a modern hotel and we liked that. Lovely colonial building evoked days gone by, in central location by the river. Easy to get to everything we wanted to see. 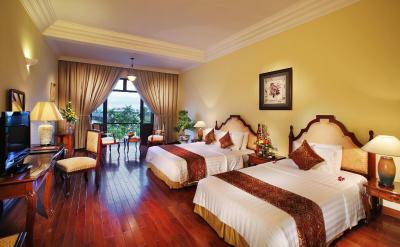 Staff were very helpful in arranging day trips in a private car, as well as transfer to Hoi An. Room was very spacious with a good view. Breakfast was outstanding. Good pool too, which was nice to cool off in after a hot day. Excellent value for money. The only thing we did not like ,was coming off a day tour to find there was a private party going on for their anniversary and could not even get a beer! .Staff said we could but no one around to fulfill this request. Lovely breakfast in the courtyard. The room facing out to the bridge with all of the traffic was quiet.Beautiful hotel .Loved it and the history . Great check in with experienced staff member. Nil problems at all over the three days . Any that really mattered.Would highly recommend.Great cafe outside.